Take I-93 North to Exit 37-A onto I-95 North. Take Exit 45 (a left exit) toward Route 128 North toward Gloucester. Take Exit 25 on to Route 114 East and follow into Salem. At the junction of routes 114 and 1A (Washington Street and New Derby Street), proceed straight through the traffic lights. Liberty Street will be approximately 1/4 mile on left. Liberty Street is a pedestrians-only road—see Parking below. Walk up Liberty Street past the museums/attractions. The Witch Trials Memorial is on the left at the top of the hill. Take I-95 South or I-93 South to Route 128 North. Take I-90-East to I-95/128 North. At the 95/128 split, take Exit 45 (a left exit) toward Route 128 North to Gloucester. The nearest on-street parking is available at New Derby Street and Hawthorne Blvd. There are 2 parking garages within a block of the Memorial if on-street parking is not available. 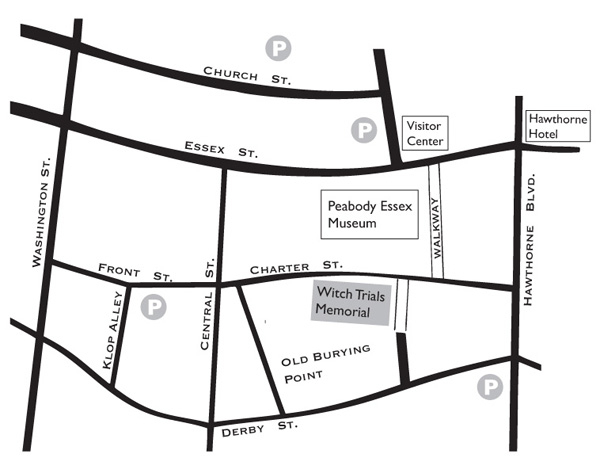 Museum Place Garage: We recommend setting your GPS for the Museum Place Garage at 1 New Liberty Street, Salem, MA 01970. South Harbor Garage: 10 Congress Street, Salem, MA 01970. Public Transportation: Commuter Rail service to Salem Depot is available on the Newburyport/Rockport line from North Station in Boston. Once at Salem Depot, proceed to Washington Street. Continue straight down Washington Street to Front Street and take a left. Front Street becomes Charter Street. The Witch Trials Memorial entrance on Liberty Street is immediately after the old Burying Ground on the right. Bus service is also available. Bus #455 departs from Haymarket Square and bus #459 departs from Downtown Crossing and stops at Logan Airport along the way. Once in Salem, the closest stop is on New Derby across from Walgreen’s. For more information for the train or bus, contact the MBTA at (800) 392-6100 or online at www.mbta.com. Travel time is approximately 30 minutes by train, one hour by bus.